Former Scottsville Mayor, Raymon Thacker, fondly remembers a day in his youth circa 1920 when C.R. Dorrier asked him for some help. "Raymon, if you tell a bunch of people to come down here to the store about 3 o'clock, we'll entertain them with something entirely new." He wouldn't say what was going to happen, but Raymon went out and passed this news to every person on Valley Street that he could find. About 3 pm, the store held 20-30 people, and Mr. Dorrier set out a little box just full of glass bulbs. He stretched a wire out of the box and pulled it out all over the store. Then Mr. Dorrier hooked the box up to electric current and began fiddling with its little dials. Raymon vividly describes what happened next. "First thing you know, here comes some voices...and we stood there, and we looked and looked and waited. Our eyes got bigger and bigger as the voices became clearer. Finally Mr. Dorrier had the box tuned just right, and low-and-behold we were listening to New York City! They were talking about a World Series game that was going on. It was a MIRACLE that you could hear people talking from New York City clear into Scottsville. Nobody could understand it! 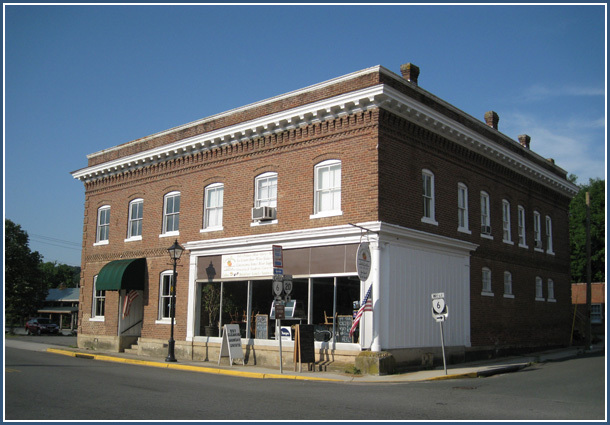 In 2010, the Dorrier building hosts Country Blessings, a grocery and delicatessen. The second floor of the building is used as a storage area and apartments.